New Brighton is a coastal suburb of Christchurch, New Zealand, 8 kilometres (5.0 mi) east of the city centre. At the 2013 census, it had a population of 2,442. The Christchurch earthquakes caused significant damage in the area. New Brighton is one of eastern Christchurch's main entertainment and tourist centres, with its architecturally unique pier and scenic coastline. The naming of New Brighton was apparently done on a 'spur of moment' decision by William Fee, an early settler of the area. When Guise Brittan, the Waste Lands Commissioner, visited the area in December 1860, he was recognised and Fee chalked 'New Brighton' on a wooden plank, supposedly in reference to his fellow settler Stephen Brooker, who had come from New Brighton in England. The Māori name for the area is Kaiuau (kai means food and aua is Yellow-eye mullet) or O-ruapaeroa (an east wind blowing along the shore). The suburb is frequently referred to simply as Brighton, occasionally leading to confusion with Brighton near Dunedin. There have been two piers in New Brighton. The first pier, of wooden construction, opened on 18 January 1894 and was demolished on 12 October 1965. The current concrete pier was opened on 1 November 1997. It is one of the icons of Christchurch. The pier will close for earthquake repairs later in 2016, and is expected to reopen in early 2018. 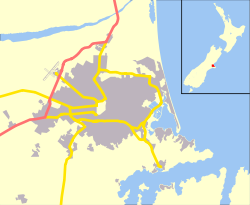 The suburb is divided into three sections spread along the southern coast of Pegasus Bay: North New Brighton; New Brighton; and South New Brighton, which lies at the northern end of a narrow peninsula between the bay and the Avon Heathcote Estuary. A 300 metres (980 ft) pier was built here in the 1990s, and opened on 1 November 1997. New Brighton was originally a distinct coastal village, separated from the then outer suburbs of Christchurch by the swampy areas adjoining the Avon River. However, urban expansion, land reclamation and drainage have led to Brighton being swallowed by Christchurch city. Staged every February, the annual Coast to Coast race finishes at New Brighton. Competitors traverse the island by running, canoeing and cycling. Every February annually, Happy New Brighton Day is one of the largest community events held in New Brighton. This is held in November annually. There is a display of Fireworks on the New Brighton Pier, beginning at sunset about 9.00pm, as well as a lights show off the pier and music. For several decades, New Brighton had the distinction of being the only place in Christchurch where general retail shops were permitted to open on Saturdays (remaining closed on Mondays), and the business district thrived as a result. With the introduction of nationwide Saturday trading in 1980, and then seven-day trading in 1990, retail activity declined significantly. A variety of bus routes connect the city centre with New Brighton. A number of well known sports groups represent the local area. Some of the most notable groups are the New Brighton Rugby club. The New Brighton cricket club and the New Brighton Olympic Athletic club. Other groups include the Christchurch Archery club and New Brighton long boarders club.Also home of the oldest Surf Life Saving Club in New Zealand, The New Brighton Surf Bathing &Life Saving Club , established in 1910. Due in part to the ground on which it was built, the consequences for New Brighton of the 2011 earthquake did not only relate to building damage. In December 2012 residents held a protest against the perceived slow progress of rebuilding in the area following the region's damaging earthquakes, in which 80 people bared their bottoms. Christchurch Mayor Bob Parker said he wasn't offended, but the residents were "wrong". These feelings of neglect by the Christchurch City Council would continue to persist. Groups such as the Peoples independent Republic of New Brighton was formed by Paul Zaaman, The New Brighton Businesses and landowners association spokesperson, in order to protest lack of investment by the Christchurch City Council into New Brighton. New Brighton was also named to be the host the finish of the annual Speight's Coast to Coast multisport race in February 2015. The previous finishing point of the race was in Sumner. ^ a b Harper, Margaret (July 2011). "Christchurch Place Names" (PDF). Christchurch City Libraries. pp. 131f. Retrieved 1 October 2011. ^ Reed, A. W. (2010). Peter Dowling (ed.). Place Names of New Zealand. Rosedale, North Shore: Raupo. p. 45. ISBN 978-0-14-320410-7. ^ "New Brighton Pier". Christchurch City Libraries. Retrieved 23 April 2016. ^ Fletcher, Jack (19 April 2016). "Pier to close for months of work". The Press. p. A1. Retrieved 23 April 2016. ^ "Centenary". New Brighton Surf Bathing & Life Saving Club Incorporated 1910. Archived from the original on 12 March 2012. Retrieved 1 October 2011. ^ "Christchurch – A Chronology – 1946". Christchurch City Libraries. Retrieved 14 October 2007. ^ "East Christchurch". Te Ara: The Encyclopedia of New Zealand. Retrieved 14 October 2007. ^ Walrond, Carl (13 July 2012). "Food shops – Shopping hours". Te Ara: The Encyclopedia of New Zealand. Retrieved 16 October 2014. ^ "Metro". Metroinfo. Retrieved 22 June 2017. ^ "Mayor not offended by 'cheeky' protest". 3 News NZ. 3 December 2012. Retrieved 18 January 2013. ^ "Angry residents hold 'cheeky' protest". 3 News NZ. 2 December 2012. Retrieved 18 January 2013.